ANYway…speaking of resting eyes, I’ve been reading actual paperbacks so as to limit the amount of time the LED screen rays affected my eyes. 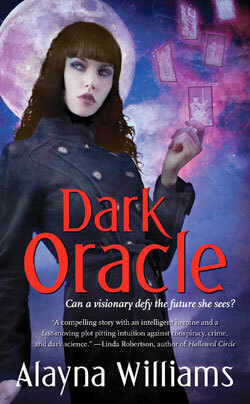 I pulled out a book that I read once and enjoyed: Dark Oracle by Alayna Williams. The book is about a former FBI behavioral profiler and trained forensic psychologist named Tara Sheridan, who left the Bureau when she was attacked, tortured, and almost buried alive by a serial killer she was assigned to profile. She is reluctantly brought back into the fold by a woman who was her late mother’s best friend–and who was also, along with Tara’s mother, a member of the Delphi’s Daughters, a group of women who have various paranormal gifts which they use to keep mankind on more or less an even keel. Tara has always downplayed her particular gifts, which include an uncanny knack for finding people, and reading the tarot cards that once belonged to her mother. Along the way, she is challenged by a member of the Daughters who thinks she should be the next in charge when the current leader dies, and finds an unlikely romantic interest in the straitlaced FBI agent with whom she has to work the case of a missing astrophysicist–a case that Delphi’s Daughters think is vital to the continuation of mankind as we know it. What I like about this book is how the author explores our society’s bipolar approach to the paranormal: on one hand, it’s spooky, crazy, fake, evil, and full of charlatans; on the other hand, it’s a useful tool and it’s accurate. I also like how the persons in Delphi’s Daughters, as well as Tara herself, are not silly “woo woo” women dressed in turbans and caftans, with heavy Eastern European accents, who dole out obscure advice while pointing at tarot cards with beringed fingers. The author uses them to make a point that the paranormal is not limited to those who aren’t “normal” by society’s standards, and that these gifts can often work in harmony with other, more practical gifts (such as psychology, mathematics, physics). As a professional tarot reader for the past fifteen years, I was pleased to see that the author kept the tarot part of the book accurate. Sadly, the author only wrote one other Tara Sheridan novel, Rogue Oracle. I’d hoped this would be a longer series, but it was not to be. Still, I recommend both books as interesting, myth-exploding reads. Keep writing,y’all…nine more days till the finish line!